What a terrifying comment. Red flags should go up and alarm bells should ring off the hook if people feel this way. Unfortunately, this does not happen. All too often, personal beliefs and perspectives stay undercover and remain unnoticed because people can only hear what they are prepared to hear. It’s not about true or false. This is this person’s reality and chances are, he is not the only one in this company who feels this way. Let me be clear. If people come to work with the feeling that the company is in survival mode and the employees just have to survive the day, thoughts of excellence, world class and success rarely come to mind. It is stressful to work in such an environment. Survival vs. success is all about our mindfulness and mindset. Have you ever experienced that seeing things from someone else’s perspective can totally change your life? I have and it continues to amaze me how well it works. 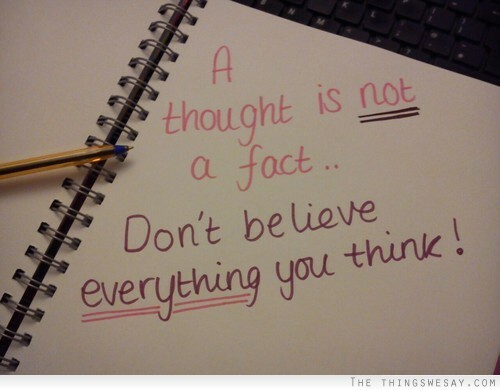 Would you agree that thoughts are not facts? Simply start thinking about thinking. Do your thoughts serve or hinder you? Be mindful of your thoughts. You may have heard this before but there is definitely a connection between feelings, thoughts, and actions. New data shows that being actively aware of your thoughts can have either a positive or negative impact on your life, and on the results that you are able to deliver. Please don’t be afraid to put a mental strategy in place. After all, few could run a full marathon tomorrow, though virtually everybody could begin preparing. The first step to success is to get started.